We’ve all watched those cookery shows on the television and said to ourselves “red velvet cake? I could make that!” So you lay all of your ingredients out, you follow the recipe carefully, but for some reason the cake doesn’t turn out like you anticipated. Maybe your weighing scales were a bit off, or perhaps you forgot to add an ingredient? When you’re not a confident baker, it’s easy to make a mistake. With Perfect Bake, you no longer have to worry about missed steps or hard-to-follow recipes. 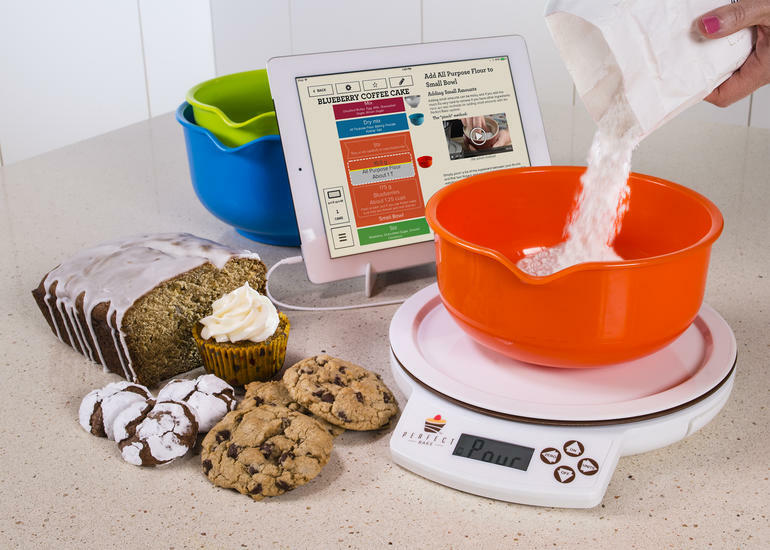 Perfect Bake is a smart scale that weighs each ingredient for accuracy and uses built in timers to alert you when you’re done mixing, baking, or cooling. 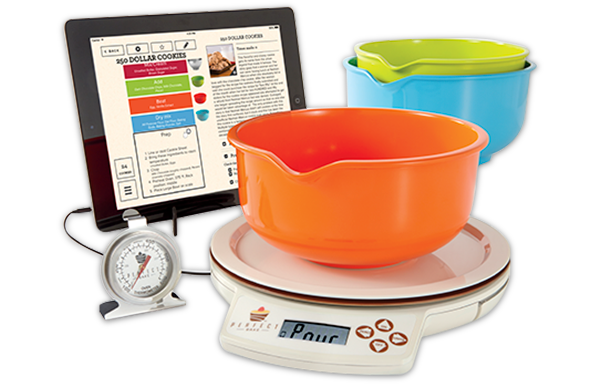 The Perfect Bake kit includes a digital food scale, three colour coded bowls, one oven thermometer and a stand for your tablet or phone. One of the great things about Perfect Bake is that there’s no need to measure anything. Just pour in your ingredients and the virtual bowl will tell you when to stop. Perfect Bake also scales your recipes to suit your needs. Decided that you want to make a larger quantity of cookies? Haven’t got the right sized pan for your lemon tart? Or maybe you don’t have enough flour for your scones? No problem! Perfect Bake does the maths for you by readjusting the recipe accordingly! The free downloadable app comes pre-loaded with hundreds of delicious and tasty recipes for you to try out, including a range of gluten-free and vegan options! And if you manage to bake your way through the entire recipe database, Perfect Bake lets you edit existing recipes, as well as add new ones, allowing you to create your own customised recipe index. The app also includes a pantry feature. This is a virtual inventory of all of the ingredients that you currently have in your home. The app uses this inventory to tell you exactly what recipes you can make without having to go shopping. Pretty handy, eh? Once you’re ready to start baking, the app will tell you which coloured bowl to use for each step. And if you’re worried that you haven’t done enough mixing or baked your cake for long enough? Perfect Bake doesn’t just have one timer, it has three timers. There’s one for mixing, one for baking, and one for cooling so your guaranteed perfect results every time! Perfect Bake is priced at €64.99 and is available directly from our website.